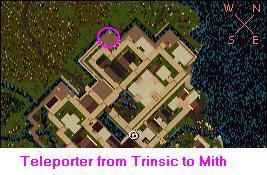 Last visited by Rocko – Dec 2 13 The city of Mith is the first player run city in all of Ultima Online. Currently, the site is administrated by Gabriel. The city is on the island between Britain and Trinsic with the 2 white buildings. The smaller building is now an entrance to the new lands.The city has the White Rose Inn, several rune libraries, many public shops, and a public Mage Tower. There is also a very nice “Lover’s Lane” on Mith that leads to a beautiful park surrounding a fountain. The city also features a teleporter to and from the mainland.